Simple to navigate and easy to use. E-Commerce enabled web publishing system: Publish pages and manage products for sale easily and quickly. TactiCom's systems can interface with most order and inventory management systems. Our proprietary technology enables all sites, including database driven, active and e-commerce sites, to be fully indexed by search engines. TactiCom's B2B e-commerce system allows for multiple price tables, discount tables and customer part numbers. All functions provided by TactiCom can seamlessly integrated with your existing site and applications. Multiple rate structures for tax, installation, retail, wholesale, shipping and handling, etc. Back-end administration systems available for changing products, pricing, pictures, availability and descriptions in real time. Import and update products and pricing from MS Excel. Interface with ERP and other applications/data sources. Both real time and off-line credit card processing. Calculates commissions based on multiple parameters and applies them to dealer accounts / reports. 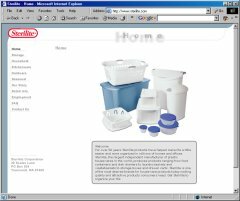 Sterilite Corporation B2C catalog, B2B Extranet system with order management. Hydro-E-Lectric, Inc. Automobile convertible tops and power window parts.